Gah! We were on a roll but early September was a little crazy with Hurricane Florence so we missed the August update :(. Here we go, back to blogging and timely updates. 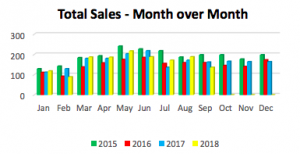 These monthly statistical reports are provided by our local Outer Banks Association of Realtors and can uncover interesting market trends. We will be posting these market stats as they become available (around the first of the month) along with any other market information we find helpful. Most of this reporting is historical meaning the total sales and volume produced were actually generated or under contract in July or August 2018, the current data portion of this report is under contract, building permits, inventory, sold home prices, new construction and days on market. The month of September never saw the final push needed to hit numbers seen in 2017, unfortunately we have seen a decline in all areas except average sale price (probably related to reduced inventory and total sales volume), price per square and number of building permits. Matt saw 8 closings during the month of September 2018 with a total sales volume of $2,490,000. Breakdown by town – 3 in Corolla (representing 37% of Corolla properties sold) 2 in Duck, 1 in Southern Shores, 1 in Kill Devil Hills and 1 in Nags Head. As always, if you have any questions or comments after reviewing the stats please let Matt know. Call, Text or Email Matt at anytime at 252.207.6588 or Sales@MattMyatt.com. Summary – Please keep in mind that these stats are for the entire Outer Banks region. Sales: Total September sales – 136 units. Residential volume sold – $49,453,362. Average Home Price Sold: The average price for a single – family detached home in September $311,000, which is down $13K from 2017. The average price for a condominium was $227,799. Median Home Price Sold: The median price for a single – family detached home in September 2018 was $294,130, which is down $25K September 2017 median price of $320,000. The median sale price of a condominium was $254,000. Price Per Square Foot: Residential inventory for September 2018 sold at an average of $194.60 up slightly from $193.70 in September 2017. New Construction: As of September 2018, the number of new construction building permits were up from 186 in 2017 to 206 in 2018, this data does not include Corolla. Per Currituck County’s most recent newsletter they have issued 541 permits for all of Currituck County as of August 31 – this includes Corolla. Days on the Market: For all residential units listed in the MLS, the average Days on the Market for September 2018 was slightly reduced at 112 DOM, down from 120 in 2018. This reduction in DOM is likely due to the low sales volume. For a full list of September 2018 MLS stats provided by Outer Banks Association of Realtors please use the following link – September 2018. For a quick snapshot of the market on a national level visit Keller Williams Realty – September 2018.